The State Democratic Executive Committee (SDEC) met in Austin on April 1st and 2nd. with them rather than robotic, political ones. We heard comments on the legislative session from Senator Jose Rodriguez and Representative Gina Hinojosa. Republicans continue to make attempts to further diminish opportunities for Texans to vote, i.e. elimination of mobile voting stations, raising penalties for small election violations in an attempt to scare voters, etc…. Conversely, election bills supported by the TDP are being advanced. One bill would change the way primary financing is handled by requiring payments to be made directly from the Secretary of State’s office to the entity administering the election. This would reduce issues where election funds have been misappropriated at the county level. Another bill would allow county elections personnel to go into nursing homes and assisted living facilities with voting equipment so residents can vote in person. This could alleviate the risk of ballot by mail fraud. Straight ticket voting is likely facing a death sentence from the Republicans. The TDP assured members that a court challenge would be forthcoming. Courts have historically sided in FAVOR of keeping straight ticket voting. conducted already have had positive responses. The tours will continue through mid summer. 554,000 vote-by-mail applications were sent in the 2016 general election. Of those, 66,000 were signed by the voter and sent to the county. Another 61,000 of those who didn’t return the application to vote by mail voted in person. Alex Gilson will prepare targets for future VBM registration efforts. Adopted the 2017-2018 budget of 4.5 million dollars. All debts from the 2016 cycle have been paid. The large increase in budget reflects a more aggressive investment in fieldwork. Birk Wilkison will return to the Party staff this summer to work with the county Parties and on campaign infrastructure. A texting program is in the works. Detailed ongoing efforts to get the Democrats to lobby the Legislature to enact our platform and asked SDEC members to sign up for subcommittees covering different bill topics. Ratification of ten new county chairs: Erath, San Patricio, Carson, Llano, Madison, Calhoun, Grayson, Henderson, Harris, and Bowie. Campaign Committee by Don Bankston: During a conference call the committee discussed the LIFT program with Cliff Walker. There is a need to formalize the endorsement process for local elections. Goal is being set to double VBM applications in 2018. Rules Committee by SD 3 Committeeman Dennis Teal: Two rules amendment requests have been received. Note: Zach has submitted two rule changes for consideration. Both make edits to clear the process on electing new county chairs in the event of a vacancy. Elections Processes by SD 1 Committeewoman Karen Wilkerson: During a committee conference call, Karen discussed a split from the base voters committee due to the diversity of issues each committee needs to deal with. Elections Processes is composed of six different sub-committees: Vote By Mail, Voter Registration, Election Protection, and Primary Election Administration. The goal will be to develop training materials and best practices documents for election judges and clerks as well as activist training. The Committee will meet at the close of the summit to elect a 2nd vice chair, secretary, and subcommittee chairs. Messaging Committee by District 20 Committeeman Eli Olivarez: Participants are still needed for Texas Voices. We are looking for local experts and leaders to help spread the Democratic message to their organizations and communities. Resolution Committee by SD 18 Committeewoman Vickie Vogel: Memorial and congratulatory resolutions were introduced and approved. can be implemented by party organizations, candidates, and affiliates. There were multiple panel discussions on how to engage with core Democratic demographics as well as the broader anti-Trump movement. We learned about candidate recruitment and how to use Party tools to benefit our cause. low turnout record feel the party and elected officials don’t listen and don’t care about them. Our message has to resonate and inspire every community. Progressive economics and positive messaging polls very high among voters. We must be real with ourselves. We are a movement, not one person or campaign. Our continuous goal is to always fight for what is right. 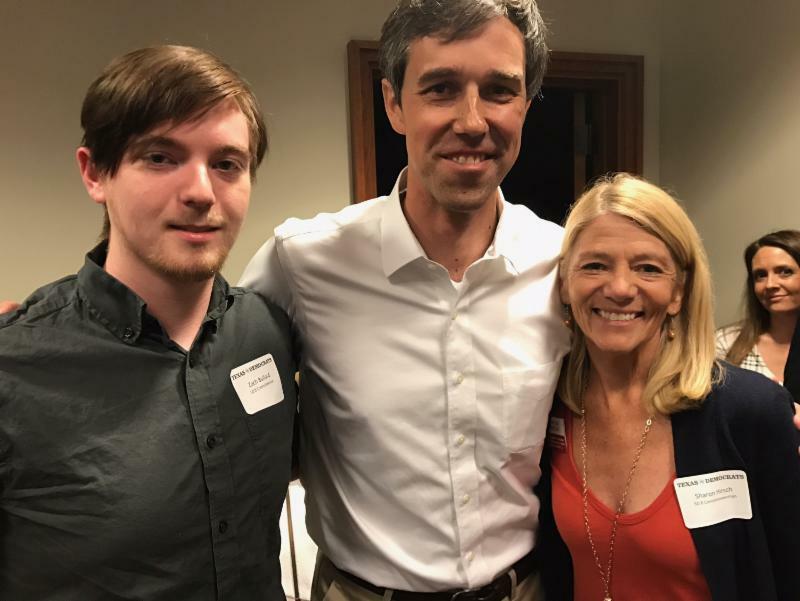 At lunch on Saturday we heard from Rep. Beto O’Rourke who will be challenging Ted Cruz for his Senate seat. Saturday night there was a reception featuring DNC Chair, Tom Perez; Vice Chair, Keith Ellison; Julian Castro; Rep. Joaquin Castro; and Chairman Gilberto Hinojosa. There was a lot of energy in the room! The next meeting of the SDEC will be held in Austin on Saturday, June 3rd. Make no mistake – we have a LOT of work to do. Will you join us? Questions?